Have the best of both worlds with marble brownies! 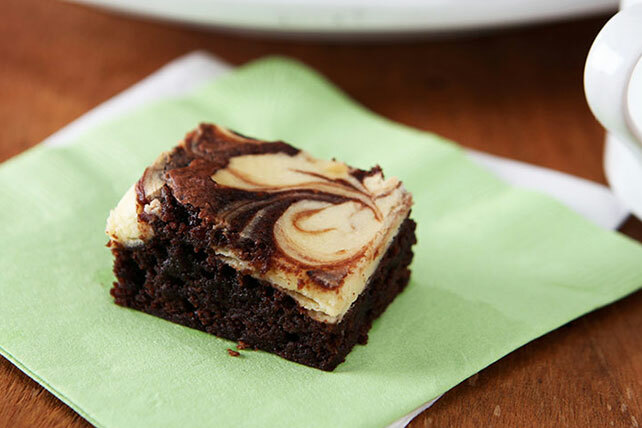 PHILADELPHIA Marble Brownies are the best way to have both a brownie and a cheesecake simultaneously. Prepare brownie batter as directed on package; pour into 13x9-inch pan sprayed with cooking spray. Beat cream cheese in large bowl with mixer until creamy. Add sugar, egg and vanilla; mix well. Drop by tablespoonfuls over brownie batter; swirl gently with knife. Bake 35 to 40 min. or until toothpick inserted in center comes out with fudgy crumbs. (Do not overbake.) Cool completely. Looking for a special treat? One brownie provides a lot of chocolatey flavor. For best results, do not use brownie mix with a syrup pouch. Chop 3 oz. BAKER'S Semi-Sweet Chocolate; sprinkle over brownie batter in pan before baking as directed.